Want to Raft for FREE! 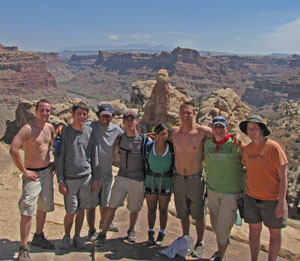 Sheri Griffith River Expeditions is pleased to offer significant discounts to our guests traveling in groups. We know what a wonderful and bonding experience a rafting vacation is when shared with family, friends, co-workers, or club members, and we are experts at developing group trips. More information on FREE river trips. With 42 years of experience specializing in Adventure Vacations with a Touch of Class, you can rest assured that your group's rafting adventure will be an experience of a lifetime. We specialize in custom charter trips and can tailor rates to your budget through adjustments to amenities. Our responsive and creative Guest Services staff can develop multi-sport packages, book lodging, restaurants or conference space, provide transportation options, and more-we will help your group leader with every step of the adventure planning.